KoopaTV: Splatoon 2 Superpowers Splatfest! Flight vs. Invisibility! Freedom and Privacy? First of all, it is entirely consistent with my Splatoon Splatfest choices to be with Team Flight after I chose Team Plane. You know, they both involve air travel. So dedicated I am to flight, that I also learned how to Flutter Jump! I'm also a big fan of birds. Why birds? I don't know. Something about their design is just highly appealing to me. Perhaps it's the fact that birds FLY. But it's not just birds. I'm also a fan of Paratroopas. They get wings. So cool. Paratroopa was my main guy in Mario Kart: Double-Dash!!. I either played as Koopa Troopa and Paratroopa, or Paratroopa and King Boo. I was also a Koopa Paratroopa fan back with Mario Superstar Baseball. 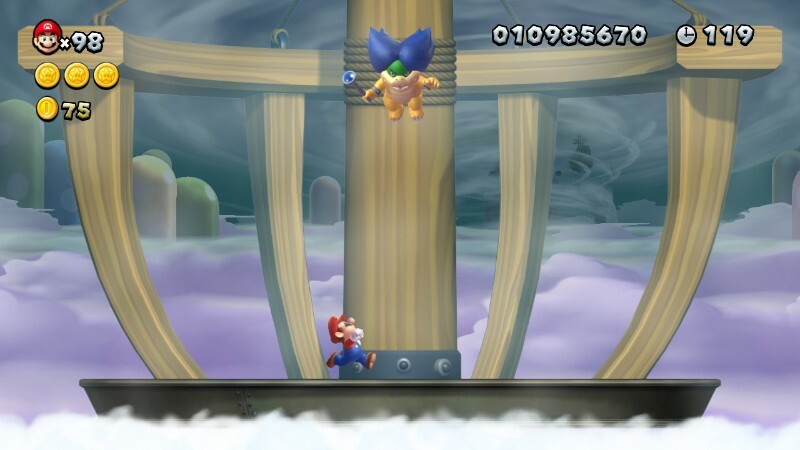 Grounded Koopa Troopas have the Sliding Catch ability, but Paratroopas had the Super Jump! Wow! Flight just allows for such an easy mode of getting from place to place. While you commoners are stuck on the ground in one dimension (left to right), flight allows a whole new dimension of existence (up and down). That is very liberating and enables so many more options that wouldn't be possible. 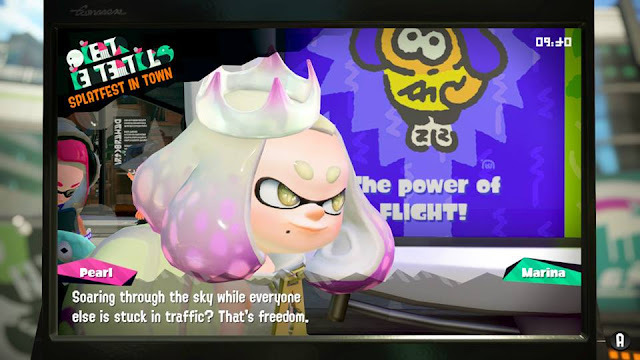 If you ignore the first part about Congress not making a law (reminder that in Inkopolis, the Splatfest results are codified into law), then we get freedom of religion, freedom of speech, freedom of the press (that's us! ), and freedom of assembly. Flight represents all of those. A big loosening of restrictions on your behaviour! Flight and freedom are synonymous at their core. Personally, I love all of those freedoms. You Americans are in a pretty unique position — most countries on Earth (and in my world, too) don't respect freedom of speech. They have tight regulations on speech. However, is freedom of speech truly guaranteed without safeguards? There is another side to this coin. I'll get to that shortly. I feel the very important need, even though I am opposed to Team Invisibility's victory in the Splatfest, to discuss why someone WOULD join Team Invisibility. 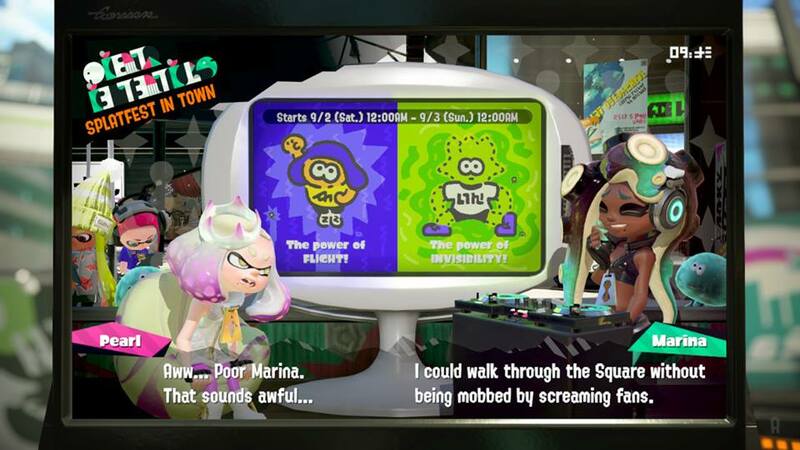 All over the Internet, I see nothing but derision and personal judgment for anyone joining Team Invisibility — assuming that they're in it for the invisibility, not just to be on the same team as Marina the Octoling. Besides, invisibility is optional when you're a pro purse snatcher! Consider the use of technology such as the Tor Project. This improves your privacy and security while using the Internet, effectively making you invisible by making you untrackable and anonymous from traffic analysis. This is important for a variety of reasons that Tor mentions, such as investigative journalism, communication within oppressive regimes, sensitive corporate account navigation, maintaining civil liberties, and socially sensitive or stigmatised discussions. This goes into your right to privacy. One could come up with reasons for why they would want privacy besides digital activity. Perhaps you're a celebrity and don't want stalkers and/or paparazzi coming after you. Marina is spot-on in desiring to maintain her privacy while being a celebrity. According to some scholars, you cannot have freedom of speech without first having privacy. You can see this on a lot of online discussion boards. Now, I make my life very public. 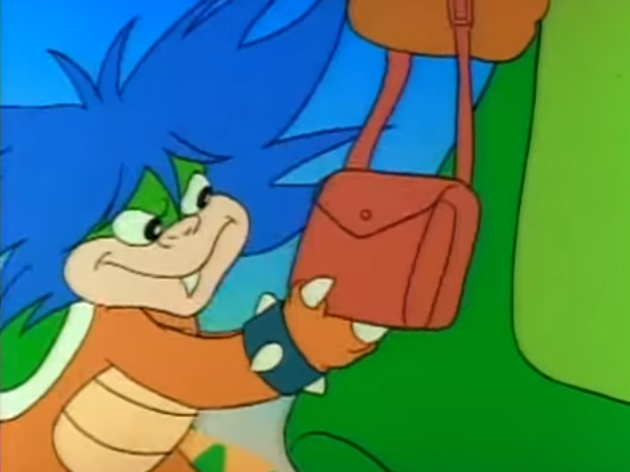 You know where I live: In Bowser's Castle in Koopa Kingdom. You know my exact identity, as Prince Ludwig Von Koopa. But while I'm putting on a brave face, I recognise that a lot of KoopaTV's contents can be controversial, and if people weren't allowed to have pseudonyms or anonymity in the comments section, we might have a lot less people claiming to be fans. Why? Because maybe their reputation could be affected if their real identities were made public, or crazy Cappy-captured humans might hunt them down. Who knows. I don't, but I appreciate the role “invisibility” plays in allowing free speech in our comments section, so I allow that on our site. Privacy is a key prerequisite to free speech for controversial content. Curiously, the United States does not have a right to privacy enshrined in its Constitution, and the USA also has a big bias in favour of freedom over privacy. In Europe, they literally have something called The Right to be Forgotten, which is big into privacy at the expense of freedom of speech. Basically, people get to get pages taken down from search engine results that are about them if they don't like the speech that is on there. That's a pro-privacy, anti-freedom (the freedom of the content providers) position. The European Union is also responsible for giant cookie notifications you might see at the top of KoopaTV, which is why we changed our logo formatting on our page. That's for privacy purposes. Am I saying that Team Flight will win in North America while Team Invisibility will win in Europe? ...Well, I wouldn't go that far, but it's possible it could end up like that. When freedom and privacy work in tandem to enable one another, then I could very well see why people would want to join Team Invisibility. When they come into conflict, I'm almost always inclined to side with freedom. Both Flight and Invisibility — representing Freedom and Privacy — are viable and important super powers for one to have. They go hand-in-hand in terms of human rights. (And rights of other species, too.) It's a little silly to say what is more important in terms of your rights, or which is your favourite. You can argue which you need first before you get the other all day, if you want, and you can do that in the comments section below. ...With total freedom of speech, and however much privacy you desire. ...That said, Splatoon 2 is a whimsical game and so it does want to be silly. Therefore, on pure face value, I conclude that flight is a cooler superpower than invisibility! A word of caution: You should be careful of organisations rising up in power right now, such as Antifa, that wish to destroy both freedom of speech AND privacy. Those are the real enemies to society. They want to clip your wings if you disagree with them, and they want to shine many lights at you in doing so. You don't get to be free, and everyone will know it and know everything about you. That's very bad. Non-participation in the Splatfest — otherwise known as “not standing up for anything” — is akin to being against both freedom and privacy, so please play Splatoon 2 this weekend! Only on the Nintendo Switch! If you're having troubles acquiring a Nintendo Switch, then perhaps you can go try getting the Splatoon 2 Nintendo Switch bundle, available exclusively at Wal-Mart. Unfortunately, that availability will be a week after the superpowers Splatfest occurs on September 1, so you are still as bad as Antifa if that's what you're waiting for. Like Antifa, CNN also wishes to deprive people they dislike of both their freedom and their privacy. Over a month later is the next Splatfest, featuring vampires vs. werewolves! Did not expect such comparisons to freedom and privacy. I chose Flight because of unfortunate incidents with both a stalker and inappropriate toucher. Both would like invisibility in order to not take responsibility for their actions and I refuse to be on the same side as them. On the other hand, if you were invisible, you would not be able to be stalked or inappropriately touched! True but what is done is done. So that shouldn't affect your decision. Alternatively, you could see Flight being more useful to the stalker because the stalker would have a better vantage point (from up above) with which to stalk you with. Being invisible from the ground doesn't help the stalker in being able to ascertain where you are. I swear I chose Team Flight, but I don't like the Internet-wide bashing of Invisibility. Marina's certain line about secretly observing someone inking Splat Zones does not help and is obvious pandering to pervs. I see that as an indictment on Marina and not on the worth of Invisibility. It's established already that Pearl has better arguments to make, regardless of her side's actual merits. 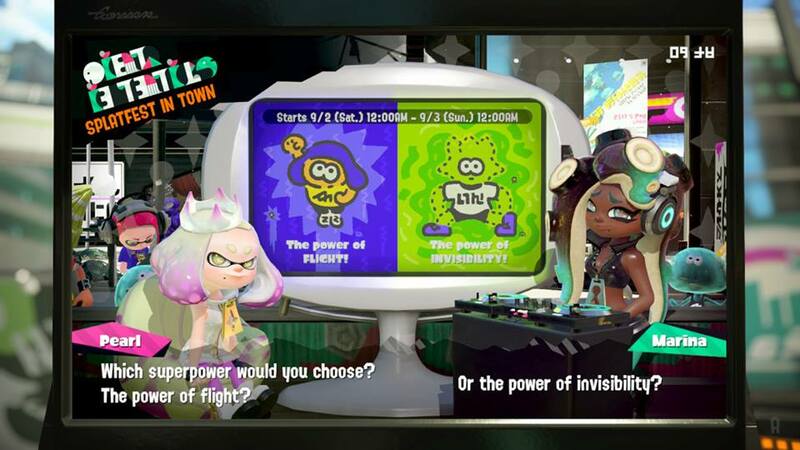 "Finally, please note that the results for this superpower Splatfest will be combined with Europe’s results – check the game on late Sunday morning for the combined final tally." I wanted to see if Invisibility would be higher in Europe like I wrote it could. WE NEED A REGIONAL BREAKDOWN IT'S PROBABLY EUROPE'S FAULT.